When purchasing a car in Indiana, you must obtain the required documentation to register and title the car in your name. If you are buying a car from a dealership, they will handle the required paperwork on your behalf. However, if you purchase it from a private party, you will need to handle the required documentation yourself with the Indiana Bureau of Motor Vehicles (BMV). Proof of car insurance for the vehicle. The bill of sale from the seller showing your name, the seller’s name and vehicle purchase price. Verification of your Social Security number. You must title the car within 31 days from the date of purchase. When you buy a new vehicle from a dealership, they will handle all the required paperwork. They will submit the required documentation to the Indiana BMV on your behalf. Don’t buy a car without a title. The title is an important document that shows the rightful owner of the car and other details. If it is missing or lost, ask the seller to apply for a duplicate copy and give it to you before making full payment for the vehicle. If you still want to get the car without a title for some time, the seller must sign an affidavit stating that they will give you the title within 21 days from the date of sale. If after 21 days a duplicate title is not issued to you, write a letter to the seller reminding them of the affidavit. The seller will have up to 10 days to give you the title. If the seller fails to respond, you can return the vehicle in the same condition and request to refund your money including the sales tax, insurance and other expenses. 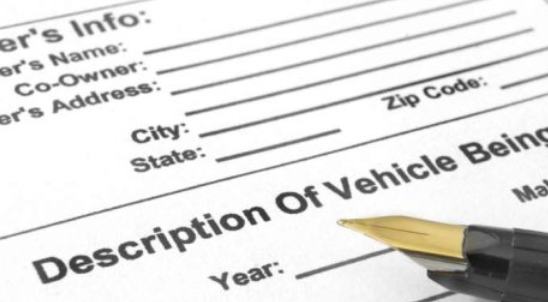 The Bill of Sale is not required when registering or titling your vehicle. However, this paper is needed as it serves as the proof of vehicle purchase and backs vehicle ownership. The bill of sale should contain the name of the buyer and seller, the date of vehicle purchase, the purchase price and vehicle make, model and color. A Vehicle History Report is not needed when registering or titling the car. However, this report is needed to verify and confirm the status and history of the car you are purchasing. By requesting a vehicle history report, you will not only avoid car problems, but also avoid a number of vehicle frauds. So, ensure you have this document at hand when negotiating with the seller.